If all goes according to plan, NASA’s Mars InSight mission will launch this weekend from California. Onboard the Atlas V-401 rocket is the InSight lander, a nearly 800-pound machine loaded up with cameras, a robotic arm, a heat probe, and a seismometer that, for the first time, will allow us to examine the inner structure of the Red Planet. But before a robot goes to Mars, it needs to prove itself on the testing grounds of Earth. This is how Mars InSight’s extremely sensitive seismometer proved its mettle before being loaded onto a rocket destined for Mars. Mars InSight’s seismometer will detect quakes by the very slight movements of three pendulums. This isn’t the first seismometer to go to Mars. The Viking landers of the 1970s carried seismometers, but between wind noise, mishaps, and insufficient sensitivity, never definitively detected a Marsquake. 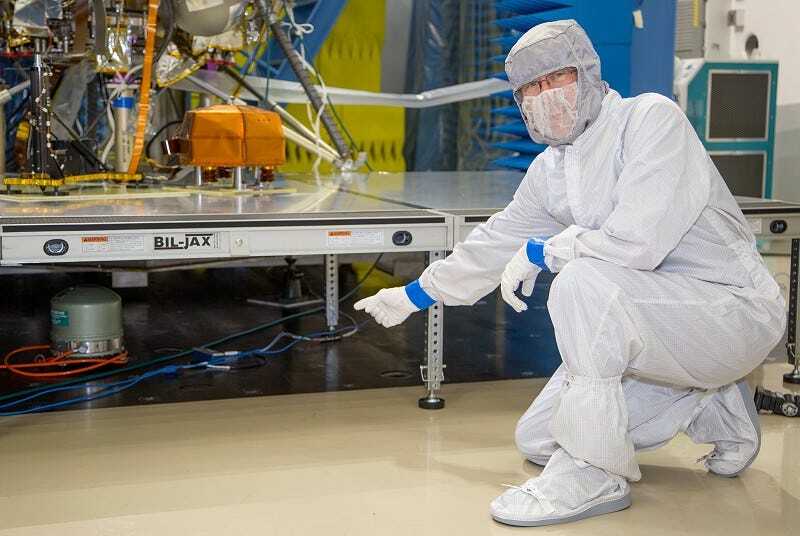 Learning from lessons of the past, InSight’s seismometer will be lifted off the lander and placed directly on the ground inside a protective casing. To decrease noise from thermal changes, the delicate pendulums that detect vibration are within a vacuum chamber. 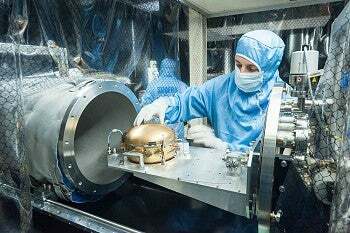 The result is a precision machine that seismometer instrument lead Philippe Lognonné of the Institut de Physique du Globe de Paris hopes will detect more than 50 Marsquakes over the mission’s planned two-year duration. Any equipment needs to operate in glacial conditions tens of degrees below zero, in a thin atmosphere of mostly carbon dioxide, all under one third of Earth’s gravity. Just as importantly, Mars is also quiet. Unlike Earth’s constant barrage of geophysical noise in the form of pounding waves (a rhythm InSight’s seismometer currently picks up even while tucked on its rocket awaiting launch) and human chaos, Mars is so silent that its seismometer must be extremely sensitive to the tiniest quake. Bruce Banerdt pointing at a terrestrial seismometer installed directly under InSight’s seismometer to allow comparing simultaneous measurements. InSight carries the highest-sensitivity portable seismometer on Earth (at least for the next few days!). 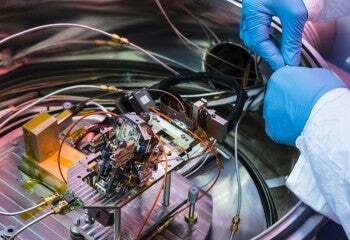 In order to ensure it will still be functional once it reaches Mars, France’s Centre National d’Études Spatiales (CNES) put it through its paces. They started with a structural and thermal model, then progressed to a qualification model to run through all the conditions expected of the flight seismometer. While it was relatively straightforward to test the seismometer under the appropriate atmospheric conditions by loading it into a gas chamber, figuring out how to simulate weaker gravity was trickier. 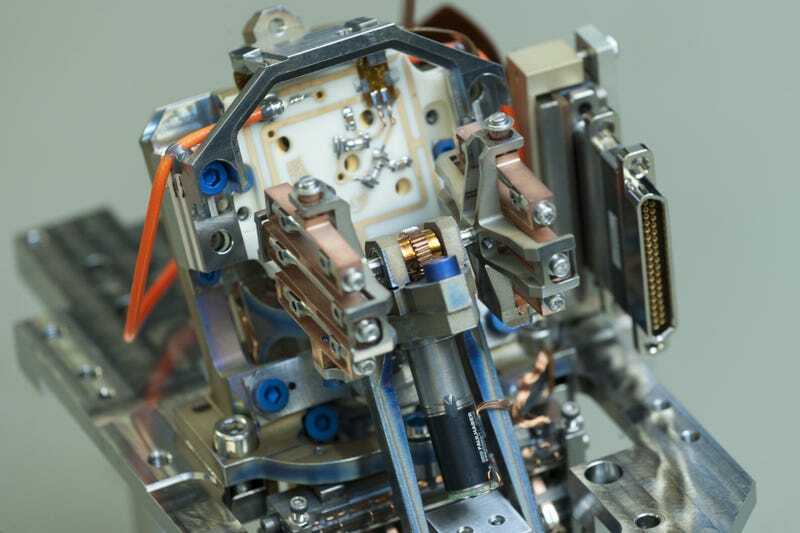 For some tests, the CNES team added a small mass to the seismometer pendulum at the pivot, offsetting weight, while for others they strapped the seismometer down at an angle, tilting it to reduce the gravitational acceleration. Removing seismometer from gas chamber. 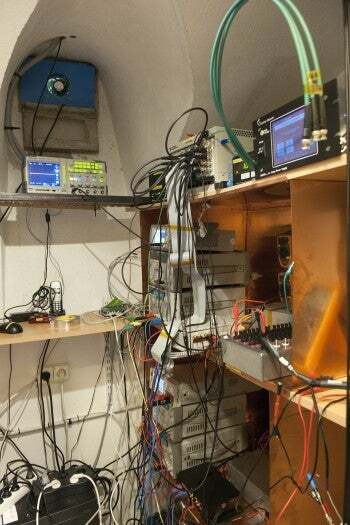 A prototype of the seismometer was tested in the quietest place in Europe, deep inside an abandoned silver mine in Germany’s Black Forest. Once integrated into the lander, the flight seismometer was also carefully tested at night during instrument integration at Lockheed Martin in Colorado, to ensure noise from the lander itself wouldn’t drown out the signal of any potential Marsquakes. “The seismometer is so sensitive that even in Littleton, Colorado, you could hear waves crashing in the Atlantic and Pacific Ocean!” Alibay said. Spikes showed up during a few overnight tests that Alibay had to track down, eventually determining they were caused by either a car driving past the facility or someone closing a magnetic door. Blasting into space is itself a problem. For a few brief moments, Mars InSight and all its delicate tools will be slammed under intense acceleration as an Atlas V rocket breaks free of Earth’s gravitational clutches. The lander will then be exposed to the harsh conditions of deep space—cold temperatures, raw vacuum, and bombarding electromagnetic radiation. Entry, descent, and landing on Mars will provide similarly stressful conditions; InSight will need to slow down fast enough for the lander to gently touch down on Elysium Planitia in November. Seismic cave in St-Maur southeast of Paris, France. InSight was put through a “shake and bake” to ensure it would survive these harsh conditions. “We literally put the spacecraft on a table and shake it to mimic what you’d see at launch and landing,” said Alibay. After, it was loaded into a thermally controllable vacuum chamber, where first it was dropped into the harshness of mock-space at extreme cold and raw vacuum. 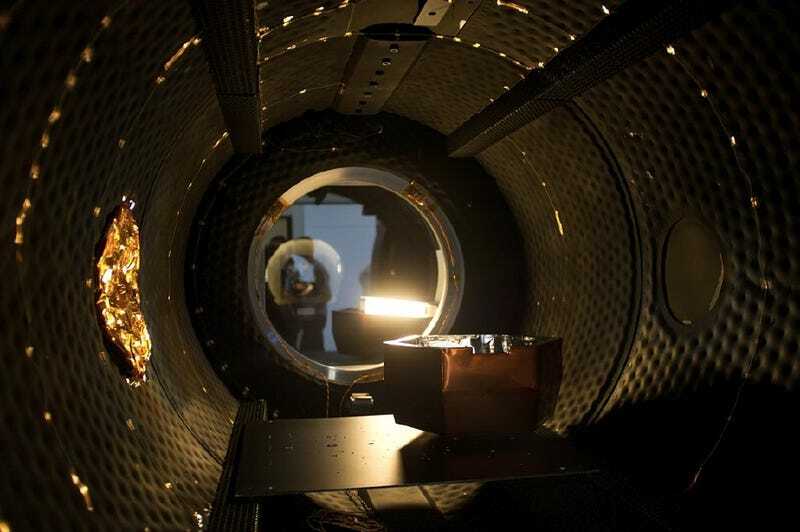 Later, the chamber was filled with an artificial Martian atmosphere and heated up to reentry temperatures (the “bake”). How InSight handles the extremes of launch and landing is haunted by the ghost of failures past. In 1976, the Viking 1 lander carried a seismometer to Mars secured during launch with a locking pin. That pin never disengaged, rendering the instrument useless. Ever since, engineers have avoided repeating the failure, instead choosing to design more robust systems that can handle the intense acceleration and vibration. Mars InSight’s seismometer builds on the Mars 96 (which Lognonné also worked on) and NetLander seismometers, a pair of missions that were never completed. Within its sealed, insulated protective casting are three tiny pendulums, one for each axis of motion. To protect them from the accelerations and vibrations of launch and landing, their motion is restricted to just a few tens of microns, or the width of a human hair. The seismometer was loaded into “instruments of torture,” CNES writes on their official instrument website, shakers that could simulate the worst that the Atlas V rocket and InSight’s abrupt arrival to Mars will throw at the sensitive equipment. To ensure that the seismometer could handle the temperature extremes, engineers baked the seismometer at three times the Martian daily high temperature, then chilled it to glacial temperatures tens of degrees below freezing. Testing one of the seismometer’s three pendulums. The seismometer faces one more hazard: interference from the powerful radio setup of the lander calling home. To test how it would fare when surrounded by magnetic fields, the team brought the seismometer to the ultrahigh-frequency antenna at the Toulouse Space Centre to barrage it with transmitting and receiving radio signals. NASA’s Jet Propulsion Laboratory got in on the testing, taking its model both to its Mars Yard and to the Mojave Desert near the Deep Space Network’s Goldstone station to test interactions between the heat flow probe and the seismometer. The Mars Yard is a testing facility set up to resemble actual terrain on Mars, including soil characteristics and rock size and colour, while the Mojave is a Mars analogue field site. The team used the heat flow probe’s self-hammering into the ground as a seismic source, successfully mapping the subsurface structures in both locations. On Mars, the probe’s hammering will help calibrate the seismometer, since the team knows exactly what to expect. When the seismometer originally underwent this battery of tests, engineers spotted an infinitesimally slow leak in the vacuum sphere that provides thermal shielding for its sensitive pendulums. Although it was so slight it would’ve taken years for an equivalent leak to drain a car tire to flat, it was enough to hold the entire 2016 InSight launch window until it could be fixed. The newly improved seismometer passed all its tests, reassuring its engineers that it is ready for whatever trials await it on its journey to Mars.